Frommelt Safety’s Vertiguard Automated Barrier Panel is a bottom-up pneumatic panel that provides physical separation between machine operators and manufacturing processes. An alternative to light curtains or area scanners, it is ideal for small interaction points with single or double robotic cells, part assembly, and conveyor openings. The Vertiguard reduces the footprint of the guarding system as compared to light curtains or scanners and provides workers with better protection from application-driven hazards. The vertically rising system also allows for overhead crane loading, and its simple pneumatic operation helps increase productivity. 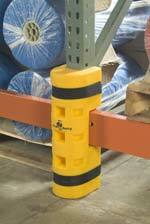 Vertiguard’s low-profile design helps prevent back injuries because it requires minimal reach-in to load parts. Danray Products LLC has introduced a point-of-operation-opening safety scale that can be used to check the point-of-operation opening for no safeguard required in accordance with OSHA, ANSI, and CSA machine safety standards. The product—made out of 0.090”-thick anodized aluminum and about the size of a credit card—has a 0.25” diameter hole, easy-to-read and scratch resistant graphics, and a tapered design that allows for usage in tight, obstructive areas. 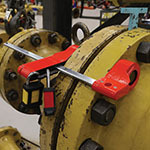 A storage solution that provides a multi-layered approach to a worker’s lockout/tagout needs on the job, the new Arsenal® Buddy System™ from Ergodyne increases work zone productivity with an organization solution for quick, easy, organized access to equipment. Brady Corp.'s new Plug Valve Lockout is designed to easily and effectively secure a manually actuated plug valve. Previously, many installations had to resort to makeshift solutions to lock out their plug valves, which make up approximately 20 percent of the valves used by industry. The valve is available in four sizes. Cascade Coil Drapery Inc.'s SafetyCoil wire-mesh fabric is manufactured with a flexible, round weave that is designed for use against the extrusion of objects from the workplace, as divider guards to secure restricted work areas, and as a barrier to intrusion by unwanted objects. The flexibility of the mesh allows cordons to be easily moved for maintenance. Illinois Engineered Products' new Xtra-Duty folding gates are designed to provide instant access control and front-line security with line-of-sight visibility and air circulation. When locked, the collapsible gates provide a strong physical and visual barrier to potential intruders. While closed or stacked, the vertical bar gates fold discretely out of the way. The SpanGuard Safety Barrier from Rite-Hite Corp. is designed to separate, define, and protect large work areas, long walkways, interior loading docks, and floor openings. The device provides a 48-inch-high visual barrier and is available in 30- or 60-foot spans connected between two steel mounting posts. Sentry Protection Products' Rack Sentry® Cutout is now available in 4-inch (100 mm) widths, making it possible to protect both the uprights and low horizontal beams of commonly used pallet racking systems. The cutouts are designed to flex and absorb the impact of collisions and then resume their original shape.